The Global Programs and Strategy Alliance (GPS Alliance) is the central international office for the University of Minnesota system. 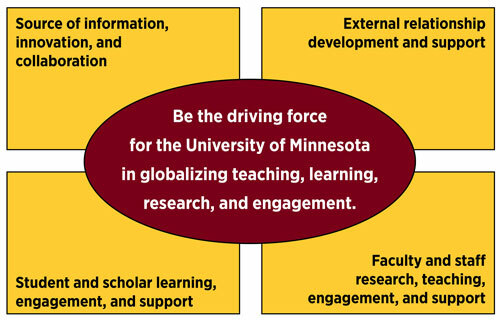 The GPS Alliance is the driving force for the University of Minnesota in globalizing teaching, learning, research, and engagement. We support the University's mission by working closely with campuses, colleges, units, faculty and staff, students, and the community to comprehensively internationalize the University of Minnesota. "Alliance" is an unusual name for a University unit, but we embrace it because it reflects how everything we do requires us to partner, join forces, collaborate, and cooperate with people on projects and initiatives across the University and around the world. What's the difference between global and international? We use the word "global" to emphasize the interconnectedness of people and issues in the global community and new forms of collaboration and partnership beyond national identity. When political boundaries and national identity are of the essence, we use the word "international." The value of the GPS Alliance to the University is consistent with the depth and breadth of the information and service it provides. We will expand our knowledge of the University's international engagement and serve as the convenor to establish international priorities and encourage international collaborations. Many of the University's most important relationships extend beyond our boundaries. From the campus and system, to the state, nation, and the world— we will identify external audiences and their needs to strengthen existing relationships and build new ones, with the ultimate goal of expanding awareness, involvement, and ownership. The University of Minnesota has long been seen as a leader in the field of international and intercultural learning. Building on this strength, we will increase exposure of students and scholars to experiences and ideas—at home and abroad—to develop their intercultural and global competence, including their knowledge, skills, and attitudes. encourage research, scholarship, and creative activities that include international content or partners.